We have three coming up in Feb and March. Here’s a snapshot of where you can come and meet us. We’ll be exhibiting at the Broadcast Video Exhibition (BVE) for the 8th year this month. Many of our customers work within the broadcast film and TV industry, and this show is an ideal place to meet. The show is at Excel London and we will be there demonstrating how our flexible leases and solutions can benefit the broadcast business, so come and see us on stand L52. 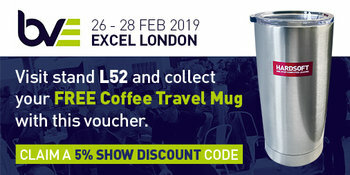 Plus, if you bring the voucher below we’ll give you a FREE travel mug, as well as a 5% show discount code! We sit in the centre of a wider creative ecosystem which is made up of many of our customers. We know that many of those customers would make perfect partners, and our experience of helping customers to build and grow their digital agencies through their technology means we can help nurture those partnerships. We thought the best way to do that was to gather them together with some great speakers at a meetup. Register here to come and meet us in Shoreditch on the 13th March. Marketing Week Live is a first for us at HardSoft. We have lots of customers in marketing, from consultants to agencies, and, after speaking to a number of them, we felt that Marketing Week Live would be a great place to meet other marketing specialists who are looking for the best solutions to their technology and financing need. We’ll be on stand MD11 and you can come and talk to our team for expert advice and claim a 5% show discount. 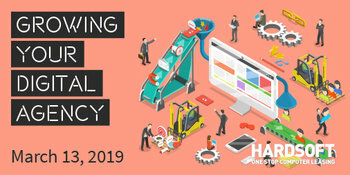 If you’d like to know more about any of the events mentioned above or want to book a time slot to come and speak to us about your specific needs at BVE or Marketing Week Live, get in touch on 020 7111 1643 or email sales@hardsoft.co.uk.